Visit Our "Online Catalog" today. Many of your favorite figurines in stock! Thank you for visiting the site for Melody In Motion figurines. 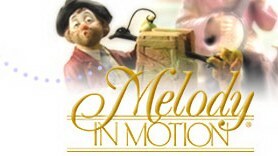 My name is Val and I am registered through the Melody In Motion company to sell figurines. I also repair these beautiful items. Please contact me if you have items in need of repair. It is my goal to offer you a pleasant, honest experience when dealing with my company. My hope is to inform you about these beautiful and entertaining figurines and make them accessible to you. your friends and family. Please do not hesitate to contact me for more information, or with any questions you have. If you are looking for a certain figurine and do not see it in the catalog. I will be glad to search for it. I have several resources and will make every effort to find the special figurine you are looking for. 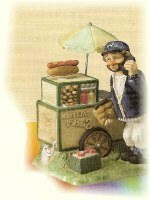 Melody in Motion began in 1985 with it's creation of Willie the Hobo. The goal was to make entertainment the heart and soul of every collectible figurine. Each figurine is made of fine bisque porcelain and beautifully detailed and crafted to stand out among other collectible figurines, music boxes and clocks. Melody in Motion has produced a variety of designs including, Santa's, Carolers,and Carousels along with the "Willie" collection. For more information about MIM,visit our Melody in Motion page. If you already collect these fine figurines, then I am sure you will be anxious to expand your collection. If you are just beginning to collect, this is a wonderful place to begin...I will look forward to hearing from you, and am excited to help you continue on your journey with "Willie" and the Melody In Motion Family. Thank you again for visiting! I will look forward to meeting you soon!